For three days and nights, Williamsburg’s Firehouse will host NYC’s Annual Soundpainting Festival. The festival will feature performances by the country’s leading Soundpainting ensembles and intensive workshops with Soundpainting’s inventor, Walter Thompson. Soundpainting is the multi-disciplinary live-composing sign language for musicians, actors, dancers, and visual artists. 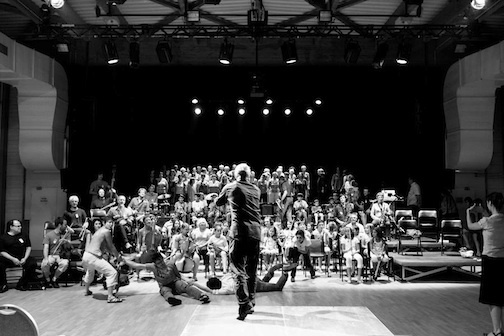 The language comprises over 1500 gestures that are signed by the Soundpainter indicating the type of material desired of the performers. Walter Thompson headlines the festival, leading his New York-based Walter Thompson Orchestra all three nights. The festival will feature six different ensembles, led by six different Soundpainters. Each ensemble will showcase its unique application of the Soundpainting language. The performances by the Walter Thompson Orchestra are funded by the New York State Council on the Arts, a state agency. Previous post 3rd Annual Soundpainting Festival May 5-7 Next postFinally The 2 Piano Weekend is here! !